Prolific throughout this decade, California’s Chelsea Wolfe has supplied our prescription of doom indie; a sensory genre that’s truly her own. A chilling aura aided by black & white toned gothic visuals belonging to videotapes from The Ring – veils instead of straight black hair hiding Wolfe’s face. Like an American equivalent of Soap & Skin, the music is consistently creepy, experimental and mysterious in its nihilistic content and distinctive style, made more cohesive by her enigmatic Zola Jesus-esque vocals. She has smartly developed her artistry and altered her construction throughout her five albums to keep everything interesting. From the purpose-placed silences of Unknown Rooms, to the mono obscurity of The Grime and The Glow to the new-found clearer production techniques that intend on haunting audiences in a more direct manner such as on Pain Is Beauty. Wolfe’s albums are the perfect balance of surprise and expectancy. 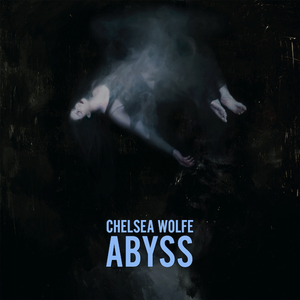 Wolfe’s fifth album in five years, Abyss descends her musical submarine into even deeper and darker depths of her subconscious. The tracks are less distinguishable, more violent and apologetically suffocating than on Pain Is Beauty; listen to the knife-slicing on ‘Carrion Flowers’ for instance. Whilst the mood and preference for guitar distortion, reverb and groans returns from her 2011 album Apokalypsis, Abyss benefits from the more effective sucker punch of its aesthetic clarity. Less suggestive, more in-your-face. Conceptually, it’s broken into a trilogy of visions reflecting what an abyss might be: 1) the supernatural interpretation of the underworld 2) the abyss within reality 3) emotional associations of alienation, desperation and mental torture- themes she’s already covered on previous albums such as on the dark ballad ‘They’ll Clap When You’re Gone’ from Pain Is Beauty. Listening to the title track ‘Abyss’ imagines the feeling of a human being, falling through the depths of hell – relating to the album cover. Initially the entrance is a hollow and empty place, but it transforms into a pit of uncertainty and confusion, as the fast-heartbeat of the victim attracts a swarm of violin flies. On an album that mostly leans towards doom rock as opposed to the doom folk of Unknown Rooms, Wolfe plays the acoustic guitar whilst being circled by desperate lost souls of the afterlife – an astonishing use of the shepherd tone effect that creates limitless density. Whereas on ‘Grey Days’ Wolfe is consumed by The River of Styx- which in Greek mythology is the boundary between life and death. ‘Iron Moon’ and ‘Carrion Flowers’ show the state of hopeless abyss in reality. The former both paraphrases and shows Wolfe relating to the confessional poetry of 24-year-old factory worker Xu Lizhi, who succumbed to his personal abyss by committing suicide in Shenzhen, China. Its title comes from one of his poems: “I swallowed a moon made of iron.” When you consider that a lot of Wolfe’s music sounds like it inhabits a metallic industrial space, the lyrics and instrumentals intertwine perfectly to create an atmosphere. Furthermore, the abyss is symbolized in nature with ‘Carrion Flowers’ being a species that traps insects by alluring them with its rotting scent. Chelsea Wolfe is still one of the most fearless and challenging musicians in the indie music scene and thankfully, for her artistic sake, she remains in the abyss of contemporary music.